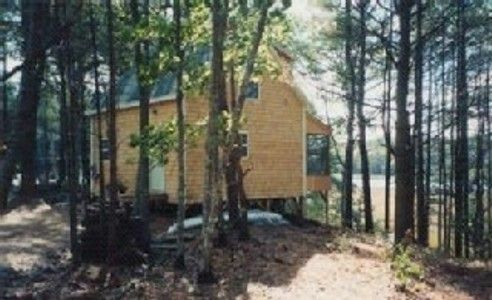 This cottage is on a small bluff overlooking the water and surrounding marshes. It is located on a secluded peninsula just 5 miles from Bath, Me. There is a hiking trail along water's edge and also kayaks and a canoe to rent to explore the waterways. The cottage has wood beamed ceilings and pine floors. There is a good size porch from which you can enjoy sunset views over the water. There is a queen size bed in one bedroom and two twin size beds in the other. The couch in the living room converts to a bed for additional sleeping accommodations. The cottage is small and rustic and everything we needed for a week away. The views of the water from the back porch were a highlight and we appreciated being able to travel with our dog. It was a short 10 minute or so drive to Bath but also felt remote with a short hiking trail on the property and ability to get my paddle board in the water without having to drive to a put in site. Please note, you need to bring drinking water but this isn't much of an inconvenience. We spent hours each day sitting in the back porch watching the salt marsh change with the tides and walking the short trail that starts next to the house. Lots to see and do within a few miles of the house. We had a wonderful week in Maine, and the cottage was perfect -- rustic, but comfortable with a great view and easy access to kayaking from the property. We slept well with a cool breeze every night, after very active days. The inclusion of a pass to Reid State Park and Popham Beach was a real bonus and a money-saver because we went to each a few times. I am rating our stay as 4 stars rather than 5 primarily because the mosquitoes in the area were awful during our stay; worse in the woods and by a river than if we were closer to open ocean. Also, the nature of staying in a cabin is hard to describe as 5 star. It was very unusual to have mosquitoes in August this year. We usually have some in early June but due to the fact that it was so unusually dry in June and July of this year (some called it draught conditions) the mosquitoes never hatched till the rain came in August. A weird quirk of nature that I have not seen before in the 40 years I have lived here and I don't think it is likely to happen again. Rustic cabin in a quiet, peaceful setting. Screened in porch offered a great spot for reading and relaxing. One evening we saw a deer running along the marsh. Internet connection was very reliable. For anyone with any physical limitations this is not the spot for them. Both bedrooms are upstairs with the bathroom downstairs. Bedrooms get very hot during the day but do cool down at night with the help of a fan. Queen size bed is not very comfortable but twin beds are ok.
August 2016 has been an unusually hot summer and especially the week this guest was here. I have never heard anyone else mention the bed being uncomfortable and I have repeat guests every year who have never mentioned it, but I will check it out and replace it if necessary. We have been staying at Back River Bend for many years and just love it there! The cabin is clean, all dishes, lobster pots, frying pans, silverware, charcoal grill-outside (you name it, it is already there). We LOVE RUTH and SAM! The rented boat slip allows us to dock our boat there and we do not have to worry about someone cutting it loose and we don't have to pull the boat out when it is low tide as there is enough water there whether it is high tide or low tide! Within 15 minute drive to: Reid State Park, known for its uncrowded sandy beaches and rocky cliffs; Five Islands Seafood, known for their shore dinners and lobster rolls served dock side in one of Maine's most picturesque harbors; Maine Maritime Museum, housing local marine artifacts dating back to 1607; and antiquing, over 25 shops within a short drive. There is a hiking trail at water's edge and a nearby deep water dock for fishing, swimming or to tie up your own boat.